Did you know that September 7th was Grandparents Day? Yes, I’m sure you all did. But here I am, a grandmother 3 times, and I’m without a clue. As usual. But the wonderful thing was, it coincided with me meeting my new granddaughter, Coralina (Coco for short), for the first time. She was born March 21st in Davis, CA and is now 5 months old. And sooooo cute. Here are some photos I took when they came to visit me in L.A. and see if you don’t agree that the level of cuteness is 12 out of 10. Here she is, Coco, master toe grabber. 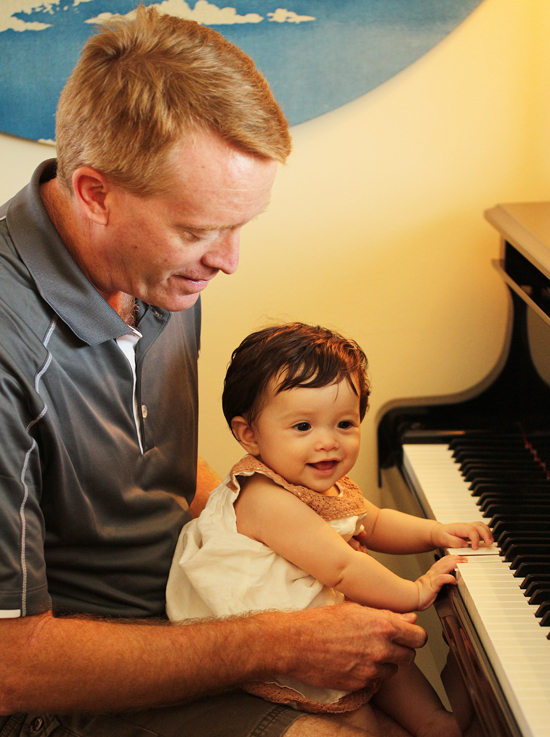 With the help of her dad, Coco the aspiring concert pianist. In the most beloved place in the world, mommy’s arms. Well, my salad certainly can’t compete with cute baby pictures, but I wanted you to have a recipe to take away with you. This recipe was inspired by Fine Cooking and it would make a really nice starter salad before your soup or main course. It’s pretty, the coins are crunchy and the dressing is so tasty. 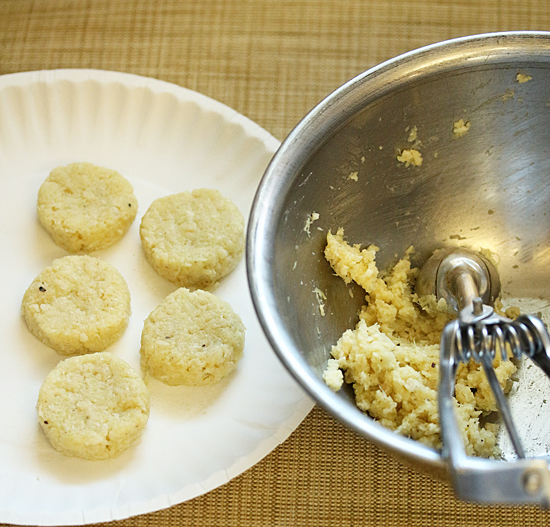 I wanted to try this recipe because I was intrigued by the grated fennel component of the coins, which made them soft in the center and crispy on the outside. Also, I love my particular mix of salad greens with Italian parsley, arugula and pea shoots. You can use whatever greens you love or have on hand. Enjoy! 1. 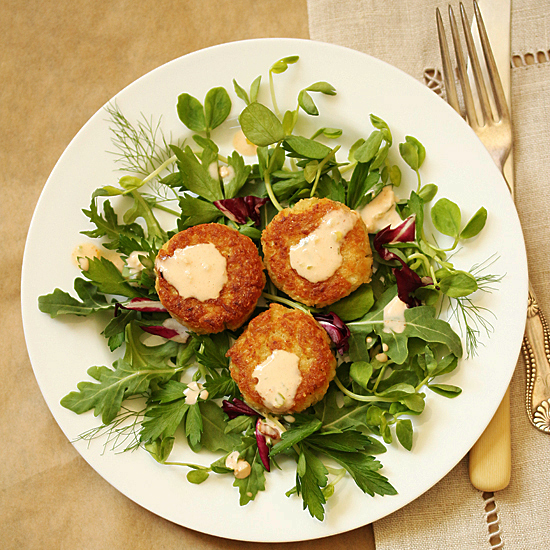 In a medium bowl, whisk together the dressing ingredients. Crumble bacon and mix in. Cover and chill for ½ hour or up to 2 days. 1. In a sauce pan, bring 4 cups water and 1 teaspoon salt to a boil. Add the grated fennel and cook for 2 minutes. Drain in a fine-mesh strainer and cool under cold running water. Press out as much water as possible and transfer to paper towel-lined plate. Cover with additional paper towel and press. 2. In a large bowl, mix together grated fennel, breadcrumbs, Romano, egg and black pepper until thoroughly combined. 3. Form heaping tablespoons of fennel mixture into coins about ½ inch thick and place on plate. 4. Heat ½ cup olive oil in 12-inch non-stick skillet over medium heat. Add 4 coins to skillet and cook until golden and crisp, about 2-3 minutes per side. Drain on paper towels. Cook remaining coins in same manner. 1. Divide salad greens among 4 plates and top with Fennel Coins. 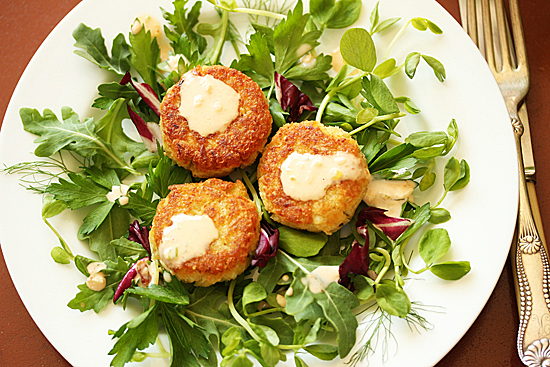 Drizzle with dressing and garnish with fennel fronds. Serve with remaining dressing on the side if desired. These fennel coins sound wonderful. You are SO inventive. And the cuteness factor with the new grandbaby is off the scale. Best wishes to you and your newest family member. Absolutely adorable granddaughter. Thanks for sharing. The fennel coins are beautiful also. I have fennel growing in my garden, so I’m going to be trying this dish this winter. she sure is a cutie…looks like your son and daughter in law…you are so blessed. It’s all too cute to eat. Well, except for Coco. Could eat her right up! Lynne, I recently made this recipe- the salad dressing was delicious but my ‘fennel coins’ turned out too moist to form into effective balls- I think I might need to add more breadcrumbs and also to squeeze more moisture out of the cooked fennel- I’ll keep trying!